Be the first to share your favorite memory, photo or story of Bettelou. This memorial page is dedicated for family, friends and future generations to celebrate the life of their loved one. Bettelou, Shipley, 89, of Moline passed away August 12, 2017 at Hope Creek Care Center in East Moline. Per her wishes she will be cremated and services will be private. Quad Cities Cremation Center is assisting the family with arrangements. Memorials may be made to Hope Creek Care Center. Bettelou was born Nov. 12, 1927 in Moline, IL the daughter of Matt and Francis Aswege Voss. 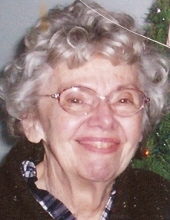 She married Ronald Shipley June 19, 1949 in Moline. Bettelou retired from Wilson Middle School as the librarian. She also enjoyed teaching Sunday School at First Baptist Church of Moline. Survivors include her husband Ronald; children Steve Shipley, Mark Shipley and Chris Voss; grandchildren Ashley, Brittney, Josh, Jennifer, Josh and Jacob and 4 great grandchildren. Bettelou was preceded in death by her parents and a daughter Kim. To plant a tree in memory of Bettelou Shipley, please visit our Tribute Store. "Email Address" would like to share the life celebration of Bettelou Shipley. Click on the "link" to go to share a favorite memory or leave a condolence message for the family.